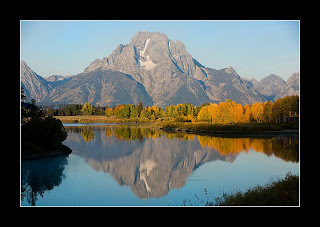 We got up at 4:30 this morning so we could leave at 5:00 to get the primo spot to photograph Ox Bow Bend. There is only room for about 15 photographers to be at this spot at one time. The sun does not rise until about 7:15a.m., so we stood there shivering in the 28 degree morning while we waited for the sun to rise. When the sun finally came up and cast light on this mountain range, a hush came over all the photographers who had gathered (about 30 or so tried to squeeze into various spots around us). It was well worth the wait! Here is the prize image from this morning. Now we are getting ready to go search for some wildlife in the evening light. Post more tomorrow! Scwabacher Landing at approximately 6:45a.m.